ST. PAUL, Minn. (Aug. 21, 2011) — Thousands of people crowded the streets and gardens near the Como Park Conservatory to see, hear, and taste a bit of Japanese culture during this year’s Japanese Lantern Lighting Festival last Sunday. However, this 14th annual festival took on a more serious tone after the devastating earthquake and tsunami earlier this year. This year’s theme focused on the rebuilding efforts in Japan. The Red Cross also had a booth to take donations to help recovery victims. Organizers say, in some ways, the tragedy has helped focus more attention on what’s positive about Japan. “We decided to choose the theme “kizuna” which means “unity”. Then, we thought to to give some action, we would call it “Standing with Japan” to express a feeling of solidarity,” explained Ben van Lierop, Executive Director of the Japan America Society of Minnesota. Three organizations put on the festival together each year: JASM, Como Park, and the St. Paul Nagasaki Sister City Committee. Various Twin Cities cultural and arts organizations with connections to Japan participate by displaying and demonstrating works, selling food and Japanese related items, and performing traditional music and dance. The event culminates in the lighting of hundreds of paper lanterns displayed on the pond in the Como Park Japanese Garden and Frog Pond. The Minnesota celebration emulates the Obon festivals that take place all over Japan at this time of year. According to Buddhism and Japanese folk belief, the souls of the dead may interact with the living during Obon. In Japan, it is a family holiday and people pay their respects ancestors by offering food and drink on a tray called a “bon” in front of an altar. They also light lanterns or small fires to guide the souls home. 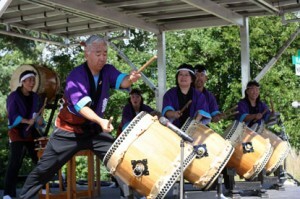 The festival in Como Park has grown into the largest Japan related event in the upper Midwest, despite the fact that the Japanese American community in Minnesota is extremely small. Van Lierop thinks that many festival visitors attend because they are attracted to some aspect of Japanese culture, whether that’s traditional dress and dance or the modern anime and manga art forms that are popular with young people. “It offers an exposure to Japan and we encourage them to think about Japan and be involved in some aspect of Japanese culture, so East and West can meet together. The more we talk to each other, the better we understand each other,” said van Lierop. A big part of promoting interest and understanding is the entertainment featured all day at the Japanese Lantern Lighting Festival. Traditional drum groups Kogen Taiko and Mu Daiko gripped the crowds with heart pounding performances that are intese combinations of coordinated music and dance. Two traditional dance groups, Sansei Yonsei Kai and Mikaharu Kai, performed odori, which is the centerpiece of Obon festivals in Japan. The Sansei Yonsei Kai is a youth group led by Linda Hashimoto. Many of its members are volunteers from the Japanese Club of Harding High School in St. Paul. That’s how A Moua became involved two years ago. “Performing here is pretty fun. You get to meet a lot new people. It’s kind of weird in Minnesota you don’t see many Japanese people around, but you come to this event you see a lot of them around. That’s pretty nice,” Moua said. Organizations such as Sansei Yonsei Kai also have booths at the festival. They sell Japanese related items, such as kimonos and accessories, which help them buy their costumes, provide lessons, and perform throughout the area. In addition, groups like the Minneapolis Japanese School, sell Japanese food at the festival to raise funds for the rest of the year. Other performers included Sakura Kai Koto, an ensemble playing Japanese classic and folk songs with the a zither-like instrument called the koto. The instrument has 13 strings supported by bridges, which are moved to change keys. The Minnesota Okinawa Sanshinkai performed songs of Okinawa using the local three string instrument called the sanshin. The Mu Min Chorus sang traditional and modern Japanese songs. The group was founded in 2002 and is comprised of singers ranging in age from their 20s to their 70s. The entertainment included audience participation for the Bon Odori (group dance). Festival attendees gathered in a large circle to dance together before viewing the lighting of the lanterns. Third graders from the Girl Scouts’ Brownie Troop at Sacred Heart School in Robbinsdale were excited to see the performances. “I really thought it would be an excellent opportunity to see something with a different culture and, hopefully, they will learn something,” said Adrienne Gooley, Troop Leader. You can see part of Mu Daiko’s drum performance and the audience’s reaction at the AAP youtube channel www.youtube.com/watch?v=zrNLdgd136w.